Welcome to fun in beautiful southwestern Michigan. Scooter Joe's offers a variety of wheels including our popular family & kid friendly Surrey bikes, our comfortable beach cruiser bikes, electric hybrid bikes, fat tire bikes and beach stuff, and now golf cart LSVs (low speed vehicles). Check all our options below. 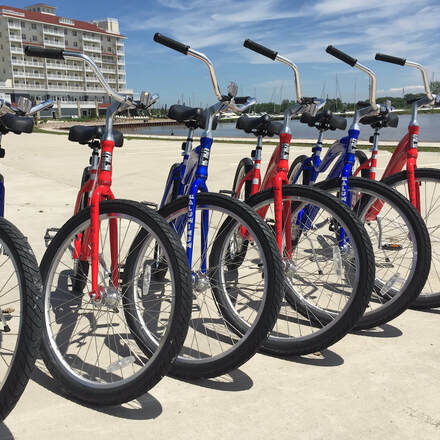 Enjoy a comfortable ride on a Beach Cruiser bike. We have 24", 16" and 12" frames available as well. Training wheels optional on our 12" bikes for little tykes. Available from both locations with advance notice. It's a 7 speed bike, but with electric assist motor. Two modes, pedal assist or throttle mode with power to . Lithium batteries last for miles depending on terrain, weight & headwind. Your range will vary. ​Please request a bike lock. Great fun and a cool ride. Must be 16 years old​ and wear a helmet, and sneakers (no flip flops or loose fitting sandals). 16 & 17 year olds MUST BE accompanied by a parent during the rental period. Provide a major credit card in your name for a $250 deposit per electric bike (sorry, no debit cards for deposits). 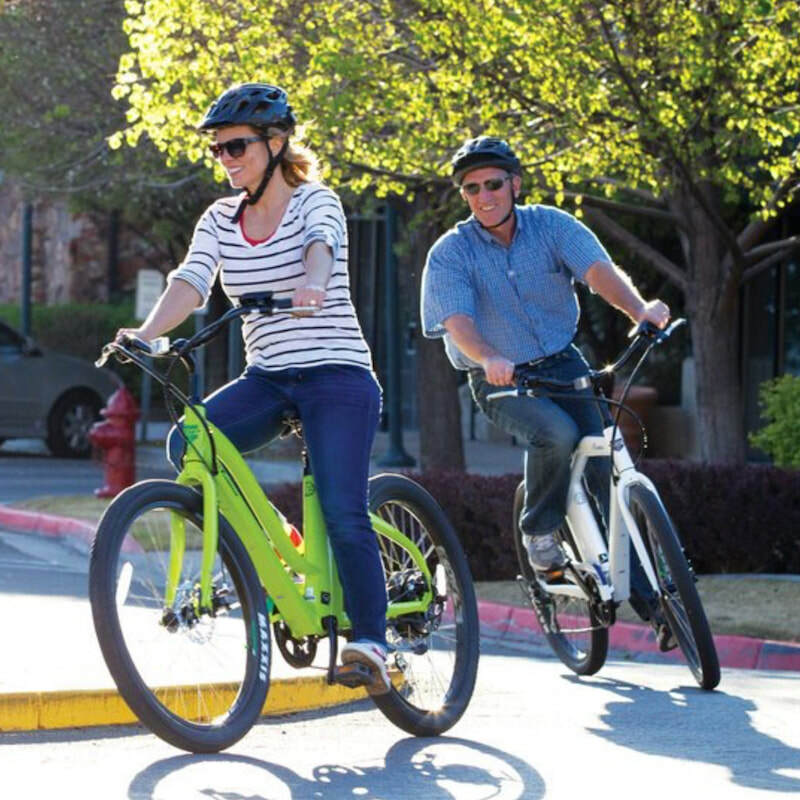 Electric bike rentals include a full battery. We recommend pedal assist mode vs. full throttle mode to extend battery range. An additional full charge battery may be available for an additional $5 charge if you return within your rental period. Rental time is contiguous (no splitting of rental time). 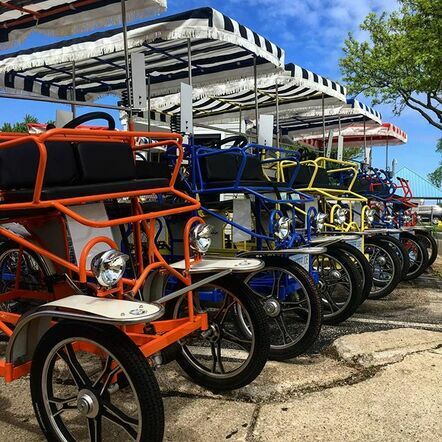 ​​Note that we reserve the right to limit total weight & may suggest a second Surrey for safety, easier pedal, and a more enjoyable experience. Available fom our downtown location. Safety first, but have fun. A licensed driver is required to operate our Surreys. No standing on pedals while moving or parking. 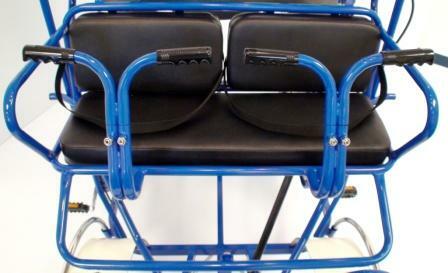 Bench seats are not adjustable, so minimum height required to pedal. Surreys are a physical activity. Take your time and enjoy the ride. Take breaks as needed. Most Surrey trips include the beach which is below the bluff and down the hill. Getting down is easy, but we'll ask you push the Surrey up the Park Street Hill (don't worry, we'll explain before you leave). Surreys are considered bikes, so all bike rules apply. Our crew member will provide short & simple instructions and answer any questions. Make a Reservation Request or Contact Us with a question. For two small kids, up to 90 pounds capacity. Pet carrier available for your small, well mannered puppy. Try a Fat Tire bike for a smooth ride overall, and ours are dual speed. A quick back pedal to switch to low or high gear. 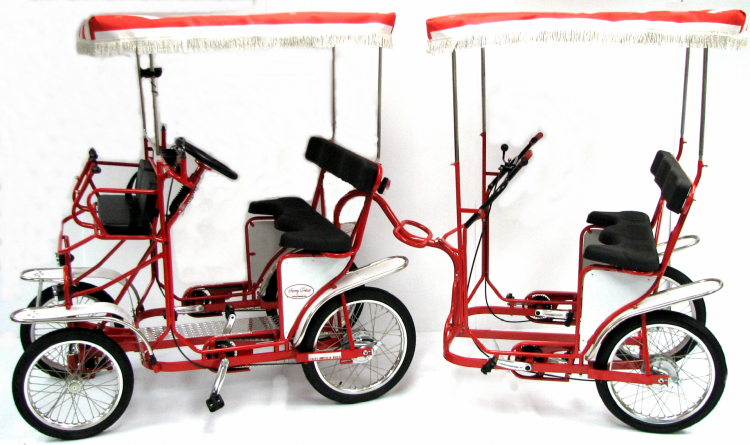 For motorized fun, our 49cc scooters are a great way to explore the area. A full tank of premium fuel is included. You must return tank full (premium gas) or use our convenient refueling option at the time of rental, and we will take care of it for you ($7). Very limited liability coverage is provided as part of rental agreement, however you are responsible for physical damage. You are responsible to identify any physical damage like scratches or dents prior to departure. We reserve the right to deny any rental. If we do not feel you can operate safely and have the confidence to be on the road with other vehicles, we can offer our Electric Bikes as an alternative. No need to feel bad about this ... we want you to have a safe experience, and our iZip Electric Hybrid bikes are way fun too (and you can take them places you can't with a moped). REMINDER: Riding bikes including our Surrey bikes are a physically demanding activity. Though pedaling is a healthy exercise, everything should be done in moderation and you should be sure you are physically capable of participating in this or any physical activity, This is especially important on hotter or more humid days. Stay hydrated, take a short break during your ride and protect yourself from the sun.